Yavilah McCoy’s African-American family has, four generations and counting, been on a journey into Jewish living. Along the way, she and her ancestors transformed and enriched the Jewish community in ways that are only starting to be felt on a broader stage. In The Colors of Water, a theater piece with music, Yavilah recounts her family saga – and sings its beautiful songs – in her own powerful voice. It was her great-grandmother, Naomi, who first felt called by the Hebrew bible and its theology of a personal, unmediated relationship to the Holy One. Naomi passed this connection down to her children, and it changed, grew, and ultimately became a formal commitment to Jewish practice and community. 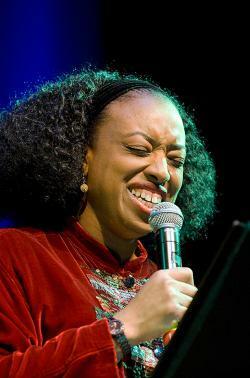 The story of her family’s struggle to find its rightful place in the Jewish world, and the arc of Yavilah’s own journey, is the substance of this production, which integrates the rich cultures of both the Black and Jewish peoples, and combines her family’s gospel singing tradition with classical Jewish liturgy. The Colors of Water premiered in 2009, as a benefit concert for Mayyim Hayyim. Yavilah agreed to make this extraordinary gift to our organization because of our commitment to inclusion and diversity in everything we do. As she has said, “In African-American spirituals, there is a tradition of singing about ‘someday.’ But you can get pretty tired of singing about ‘someday.’ For the sake of my family, and for my own sake, it’s important that there be spaces like Mayyim Hayyim where a warm, inclusive embrace is not ‘someday,’ but now. The audience at the first performance of The Colors of Water was inspired, entertained, enlightened, and deeply grateful to have been in the theater that day. Don’t miss your chance to experience Yavilah McCoy’s remarkable voice and her heart-felt performance. You’ll laugh, you’ll cry, you’ll see the Jewish world through new and wiser eyes.